"I dressed like a queen. Even then. I always dressed, and my family always saw that I could have very beautiful clothes. People thought if you looked like that and you already had expensive and gorgeous, expensive clothes and jewelry and everything, how could you use old woods in your work? There probably wasn’t one person on earth that understood what I was doing. At the time, you see, the work was different, old wood, nails, mirrors and glass, all the goddam things." – Louise Nevelson, from 'Particular Passions: Talks with Women Who Shaped Our Times', by Lynn Gilbert. The oral biography of Louise Nevelson, whose work and vision elevated sculpture to its current place of prominence in the arts. Available at Apple and Amazon. "My family wanted me to be an artist, although there were no artists in the family. It was simply that they were interested in art, they liked the idea. I used to draw (horrible drawings they were) when I was a child, so they said, “Obviously she’s going to be an artist,” and I was pushed at it. My father was an architect and engineer, and he went to some trouble to find out which one of the women’s colleges in the East had the best art department, and he picked Smith. I think it did perhaps have the best, and its museum was already outstanding. It offered plenty of courses in drawing and painting and of course I took every one of those." – Louise Nevelson, from 'Particular Passions: Talks with Women Who Shaped Our Times,' by Lynn Gilbert. The oral biography of Louise Nevelson, whose work and vision elevated sculpture to its current place of prominence in the arts. "What I see about humanity makes me a pessimist. But in my work I’m an optimist. Look at humanity, look at what’s happening on this earth. I think anyone who takes the attitude that they can do something that will change the world is very naive. For instance, I’ve taught art. I’ll say to my students, “Well, what do you want?” “I want perfection,” they say. I say, “Well, who in the hell do you think you are that you can demand perfection?” It’s nonexistent anyway. Words like ruthless and sacrifice are kind of false judgments. You don’t do it that way. When you have labor pains, you don’t say, Could I have done it this way or that way? You go into labor. Those words belong to what we call three dimensions. I didn’t think like that. Living the way I did... see, I broke all the traditions. If I wanted a lover, I had a lover. I didn’t have to get married again. So I had courage to live as I understood it. I thought that art was more important than other things. I work for myself. It was only because I had so little confidence in the world that I wanted to build my own world, not the world, my world." — Louise Nevelson, in Particular Passions: Talks with Women Who Shaped The World. The oral biography of Louise Nevelson, whose work and vision elevated sculpture to its current place of prominence in the arts. Available at Apple and Amazon. 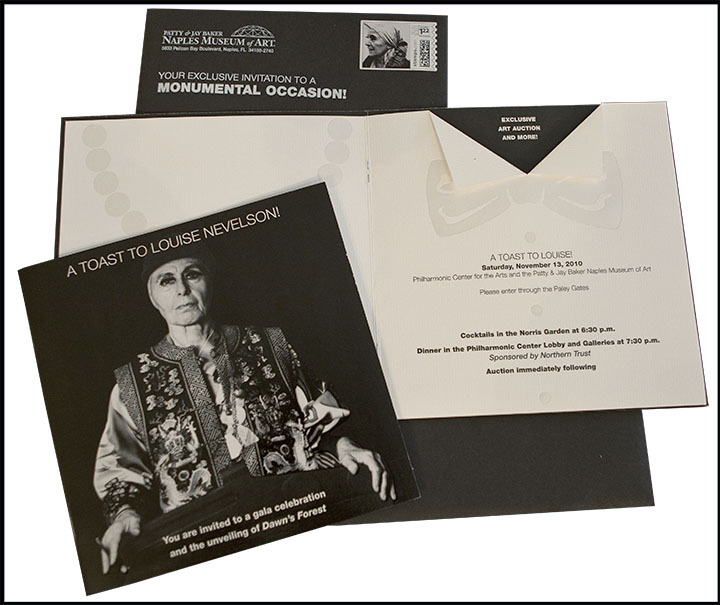 I am very pleased that my portrait of Louise Nevelson was used on the invitation to the Naples Museum of Art dinner and art auction.